Nominations are currently being sought for the 2015 American Numismatic Association Board of Governors election. ANA bylaws require nominees to secure the physical signatures of 25 ANA members, 25 ANA-member clubs in good standing, or a combination of the two in order to be placed on the ballot. Members of the Board of Governors are elected for two-year terms. The ANA’s Congressional Charter rests control of the association with the board members. All nine members’ terms are expiring this summer, and the new board will be installed at the World’s Fair of Money in Chicago on Aug. 14, 2015. Members will also have the opportunity to vote electronically or with a traditional paper ballot received via U.S. mail. Members who do not opt-in for the electronic ballot will instead receive a paper ballot. Please take a moment and follow the steps below to receive an electronic ballot, or to see if you’re already signed up for the electronic ballot. Members who signed up for electronic ballots in the 2013 Election will receive an electronic ballot unless they follow the steps below and uncheck the Electronic Ballot box. 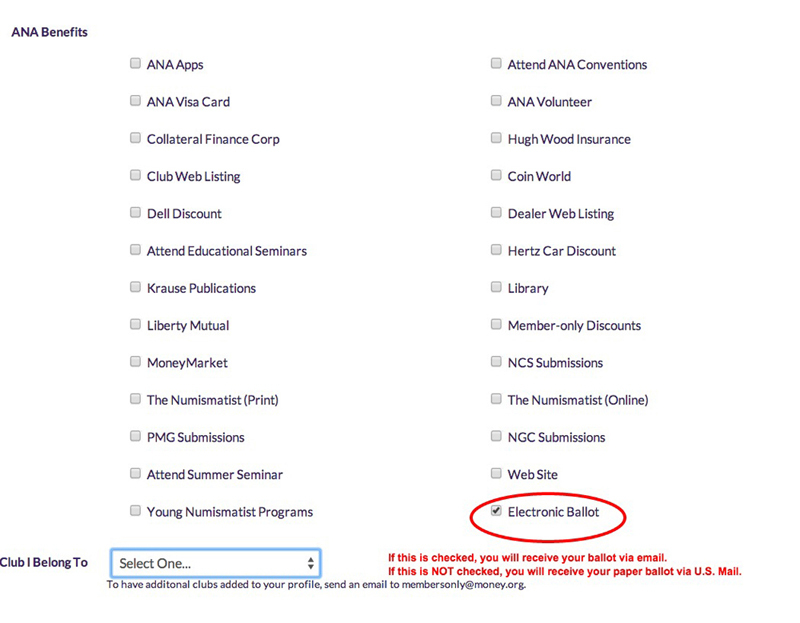 Scroll down to the “ANA Benefits” area of the screen and check the box labeled “Electronic Ballot” in order to vote electronically. Questions on registering for the electronic ballot or on how to log in to your Money.org account? Call the Membership Department at 800-514-2646 or email membersonly@money.org. Please do not create a new account.